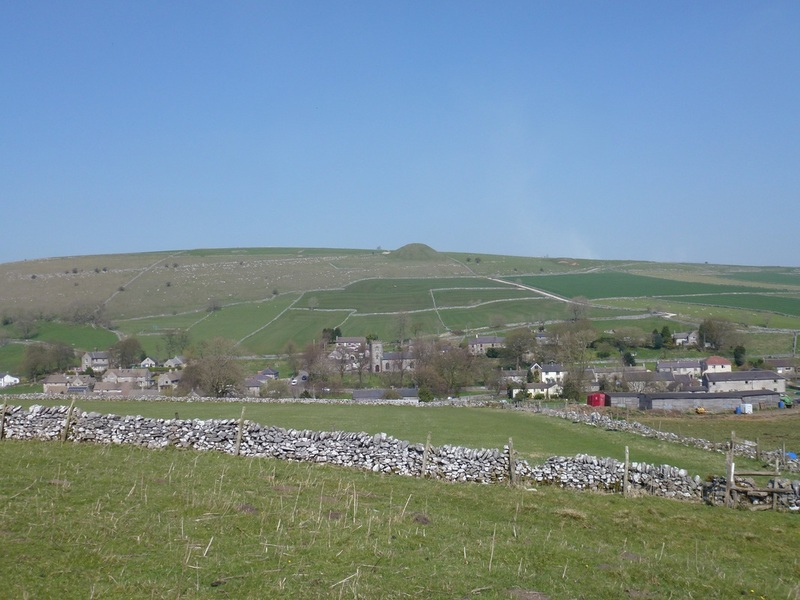 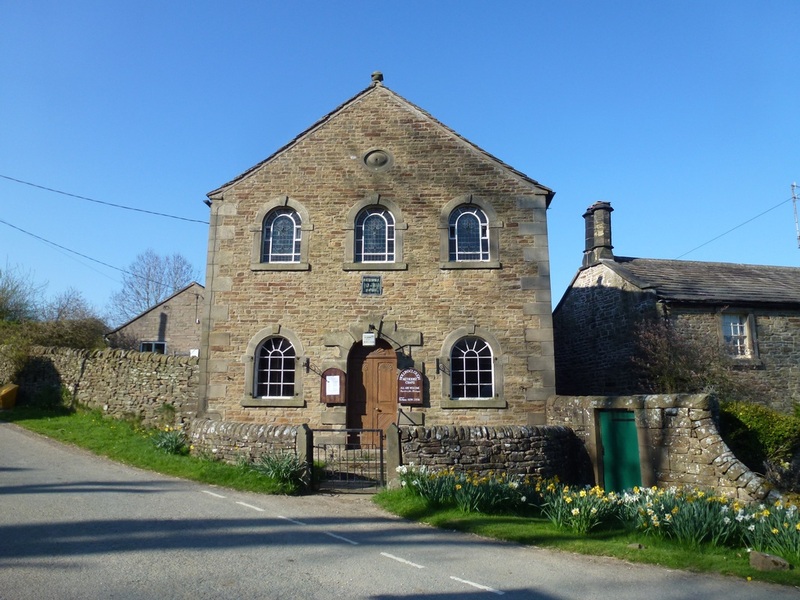 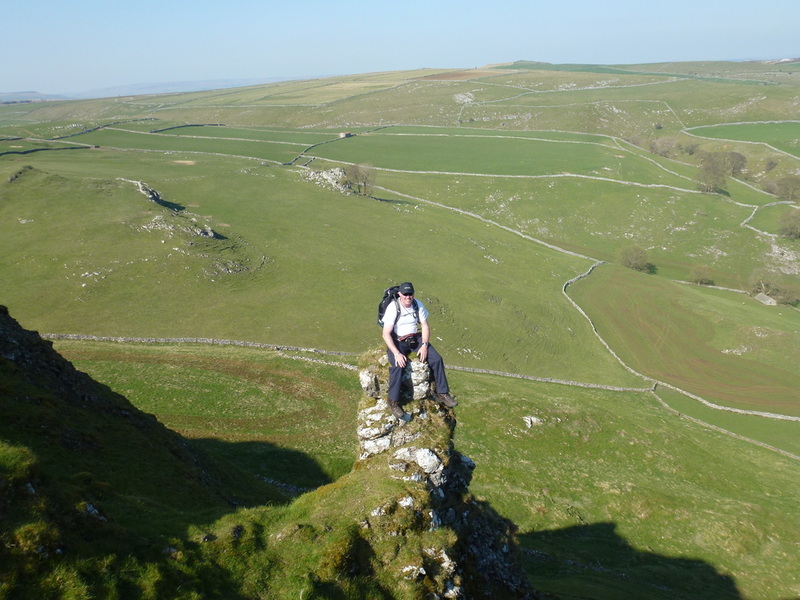 The two Peak District hills of Parkhouse & Chrome are situated in the White Peak near the lovely village of Longnor which is to the south of Buxton. 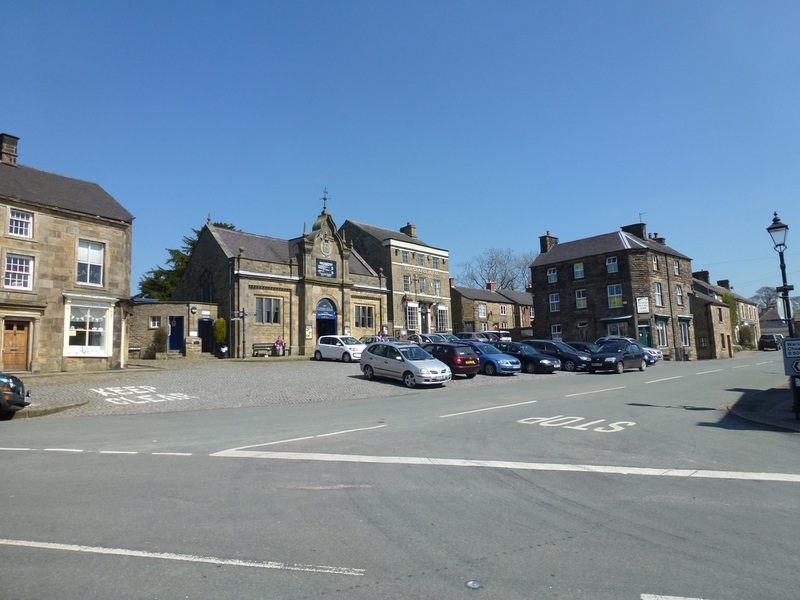 Longnor is a busy place with lots of walkers and cyclists about and has a lovely Tea Shop and a few pubs. 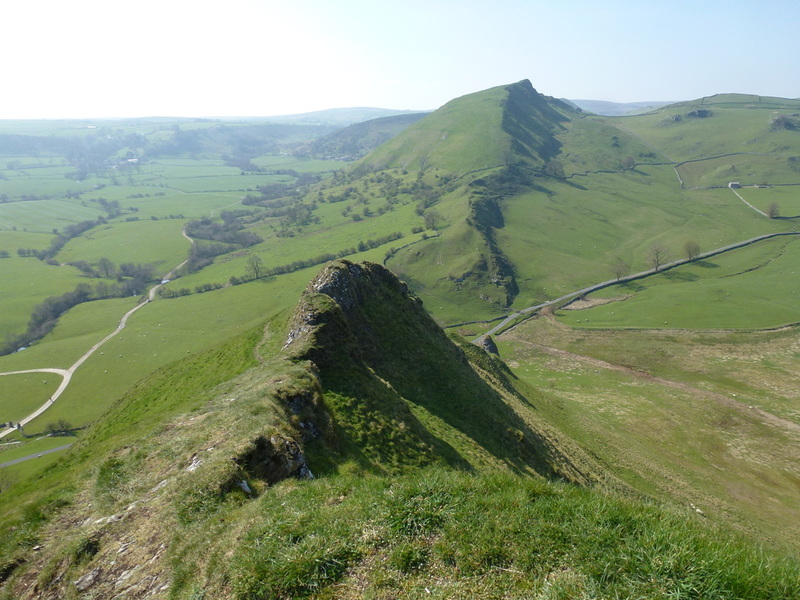 Both hills are two impressive fins of rock and whilst diminutive compared to other parts of the District, they provide good climbing, fine views and are exposed in areas giving an airy and steep feel to them. 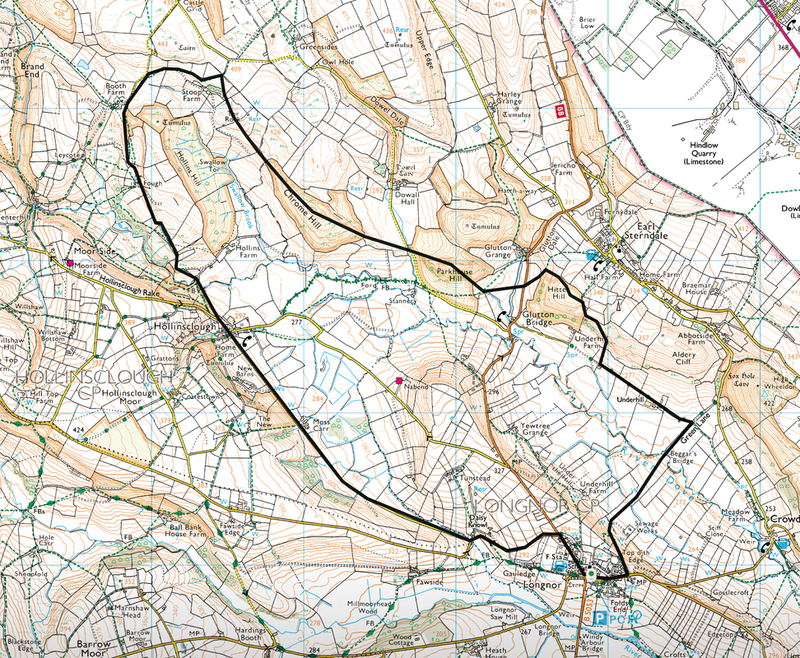 These are no pushover, particularly the descent from Parkhouse to Chrome and provide an exhilarating day out. 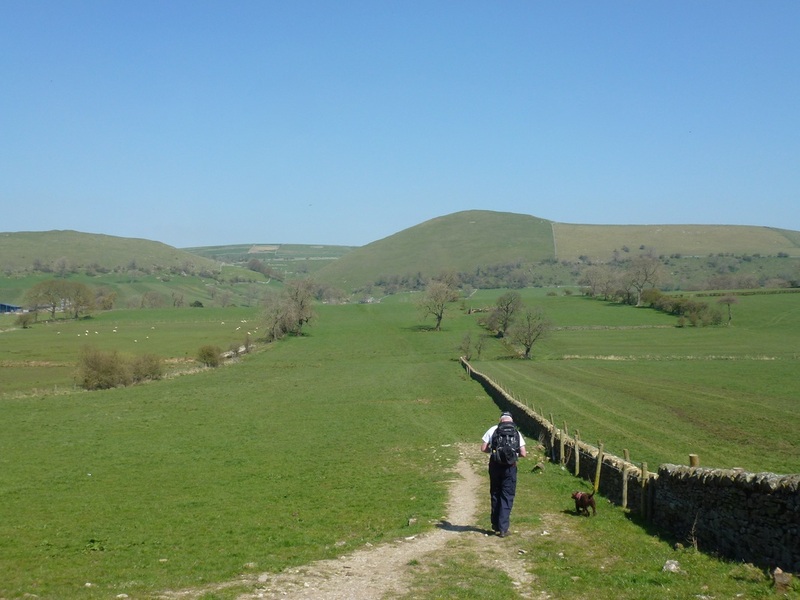 Leaving Longnor to the east, the route heads over fields and pasture to reach the lower slope of Hitter Hill to meet a path coming in from the village of Earl Sterndale. 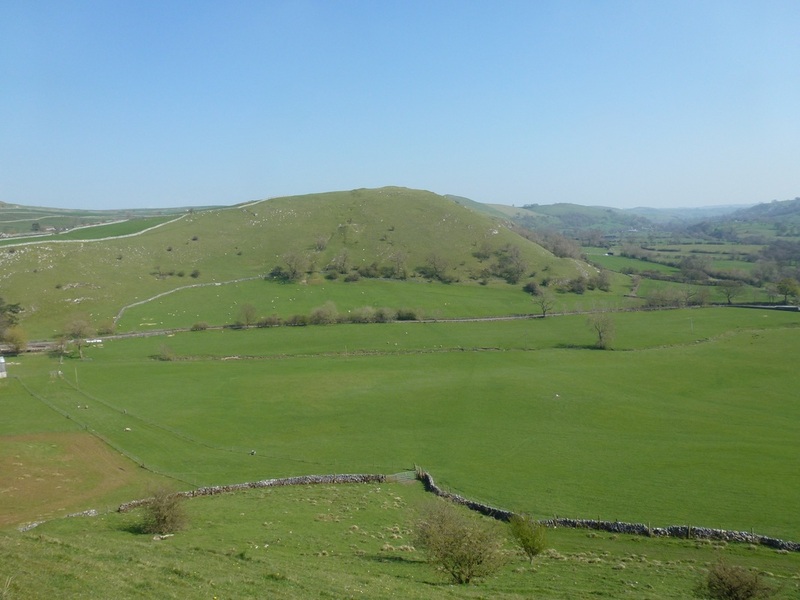 From the summit of Hitter Hill there is a steep descent on grass to reach a path (see photo below) and subsequently a road. 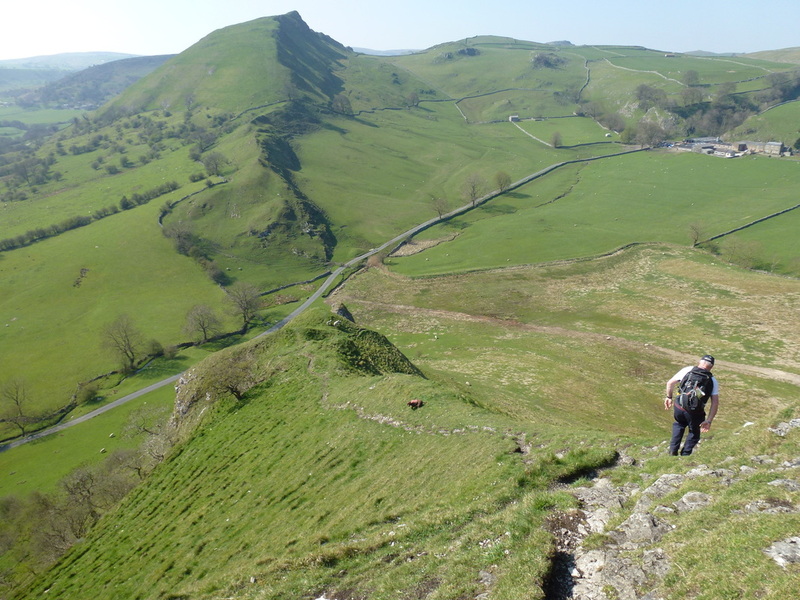 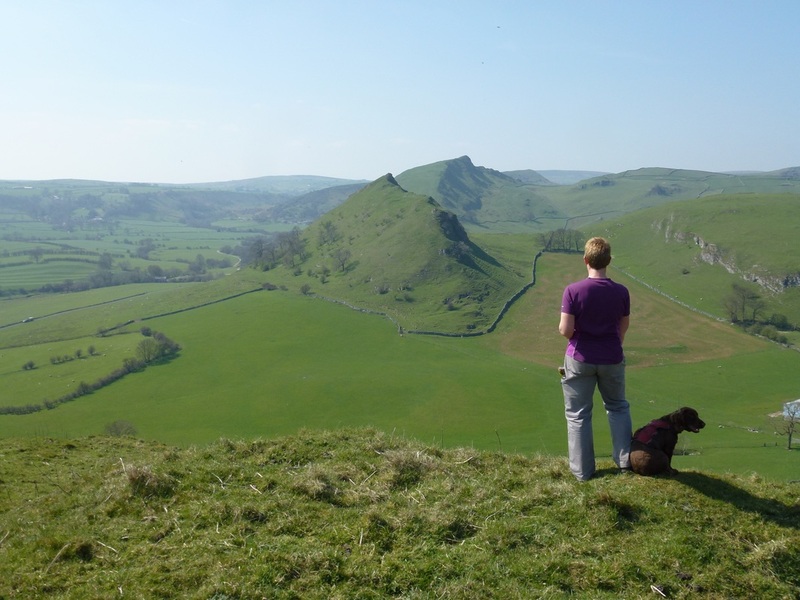 The route then heads over a field to reach the foot of Parkhouse Hill from where there is a short, sharp pathless pull up to the rocky summit. 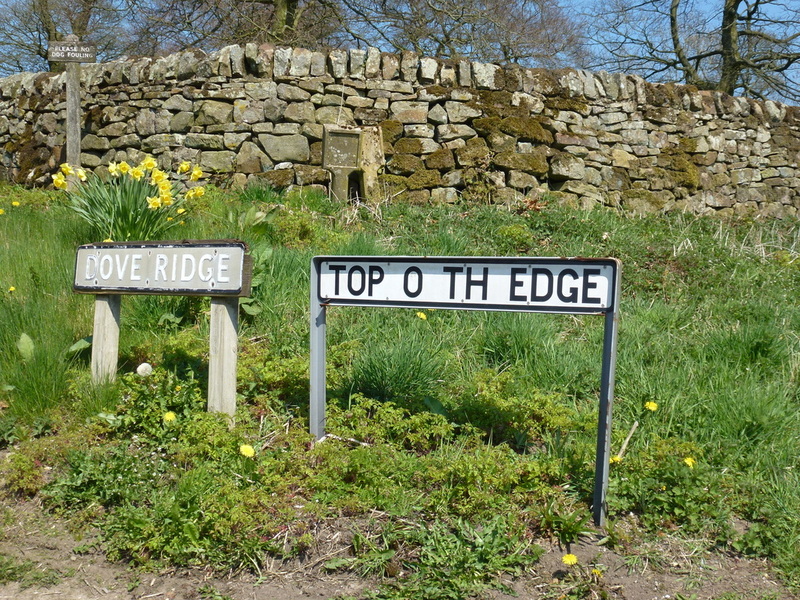 It is at the summit of Parkhouse where the fun starts. 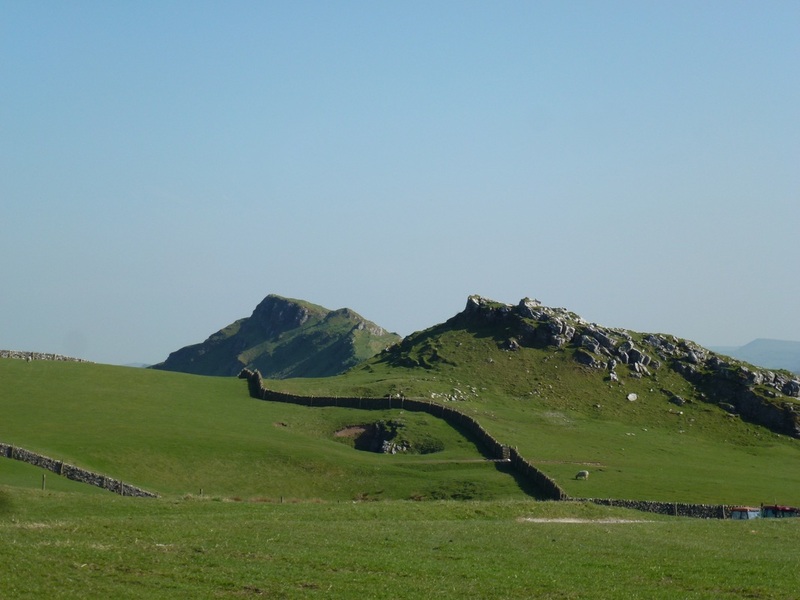 There now begins a delightful walk along the summit which weaves between the rocky outcrops to reach the top of a steep descent. 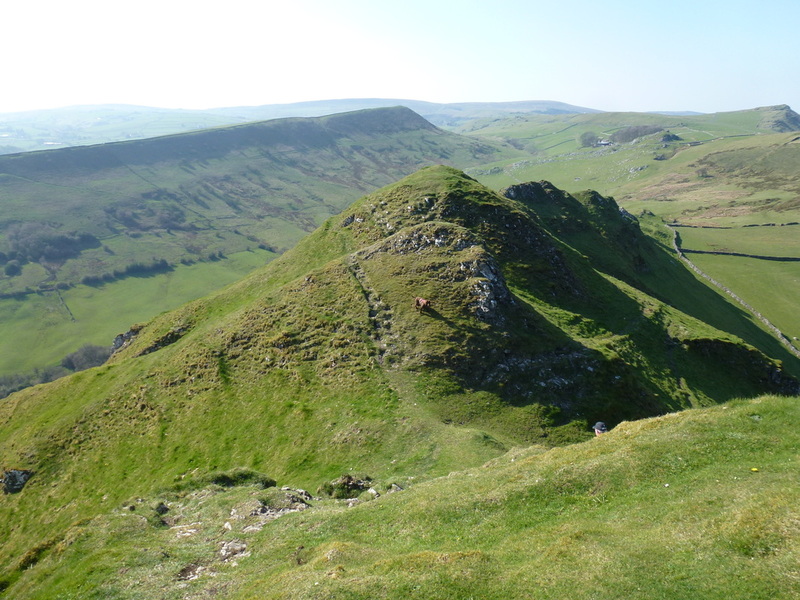 The path down is not difficult but is steep in places and winds down to the right to eventually arrive at the foot of the slope. 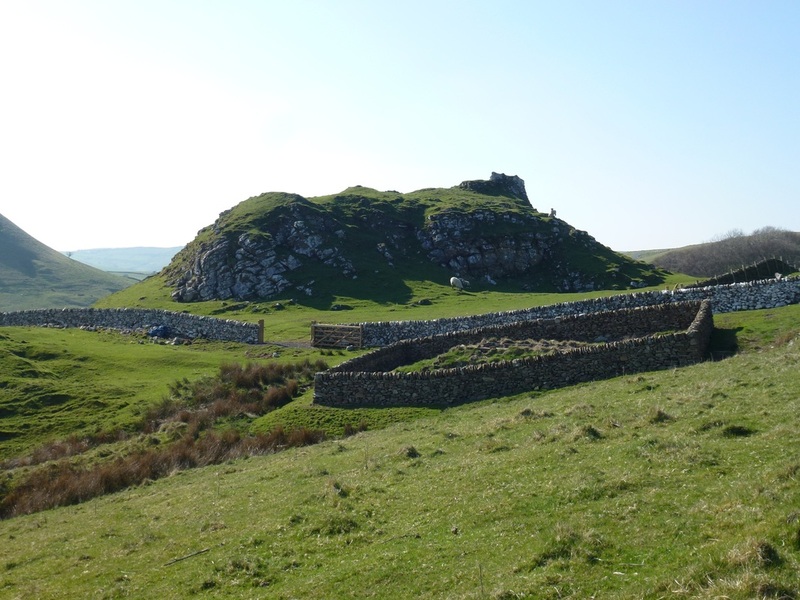 Take the opportunity a little further on to have a look back at the imposing frontage of the hill. 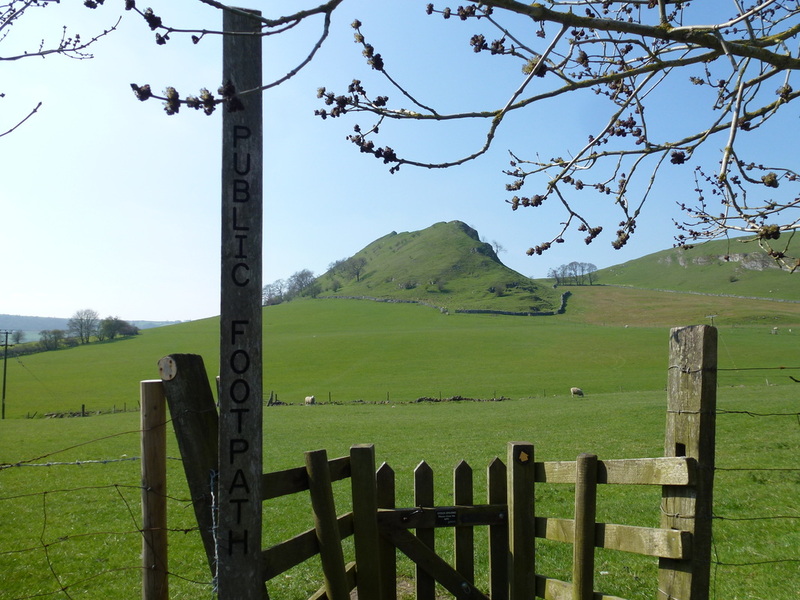 Crossing another road leads to the foot of Chrome Hill. 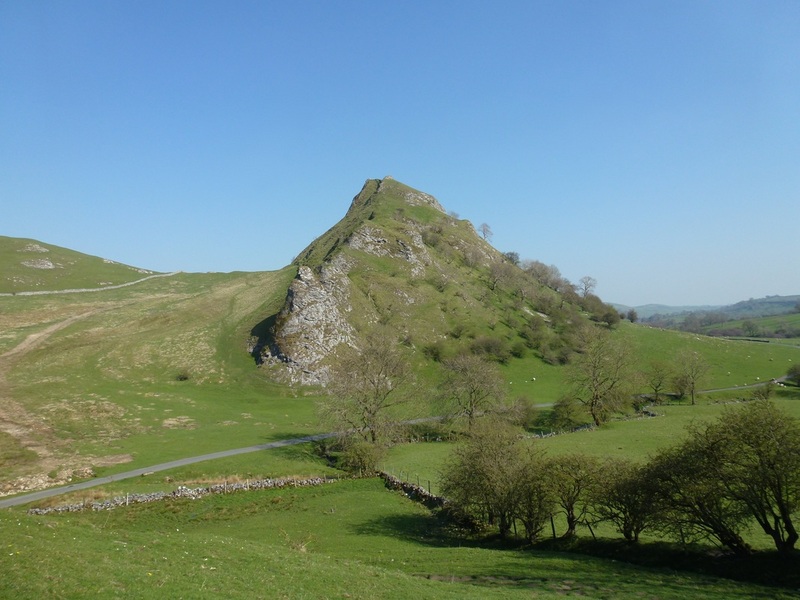 The ascent of Chrome Hill is gradual and again there is a roller coaster walk over the summit ridge to reach the descent which is gentler and much easier. 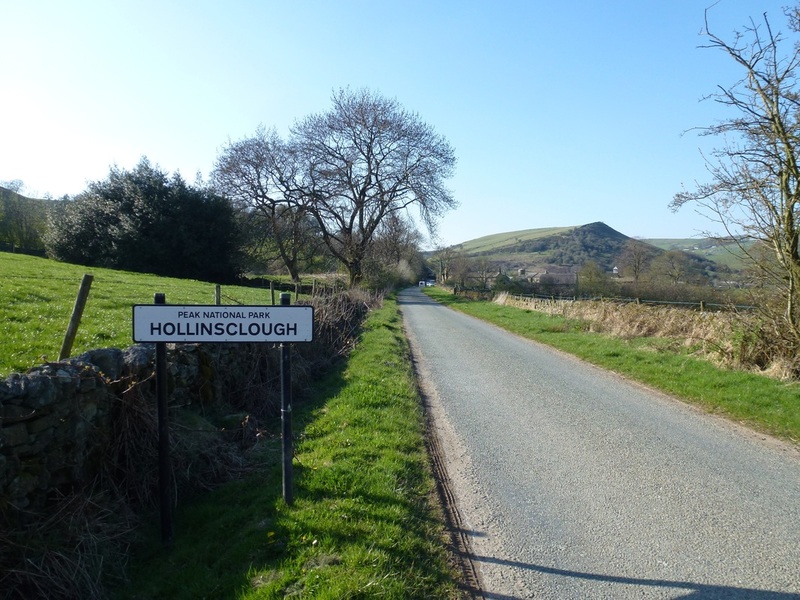 The route then passes the lovely Tor Rock before heading around Stoop Farm to reach a track which loops around the base of Hollins Hill to arrive at the small village of Hollinsclough. 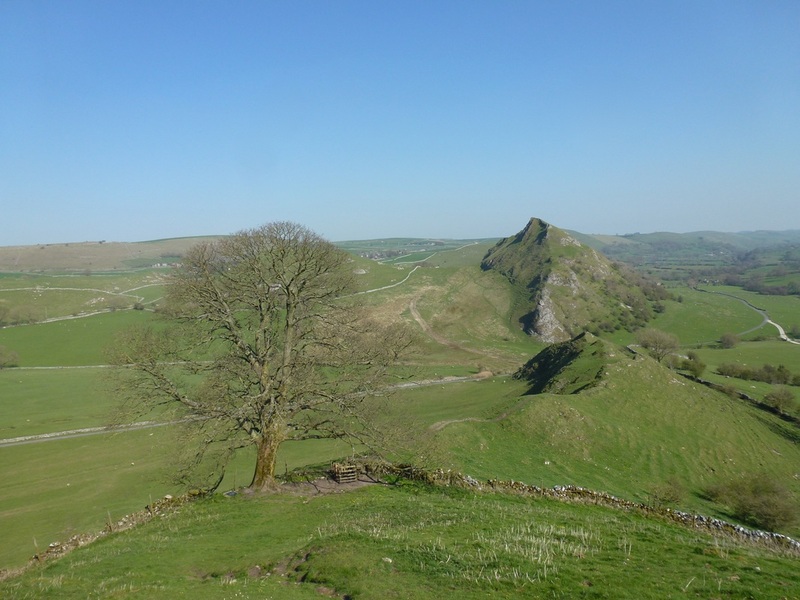 There is a choice of route here - you can either head slightly north east from the village towards Parkhouse Hill and return via Glutton Bridge or remain on the quiet road for a couple of miles to eventually reach Longnor - we chose the latter. 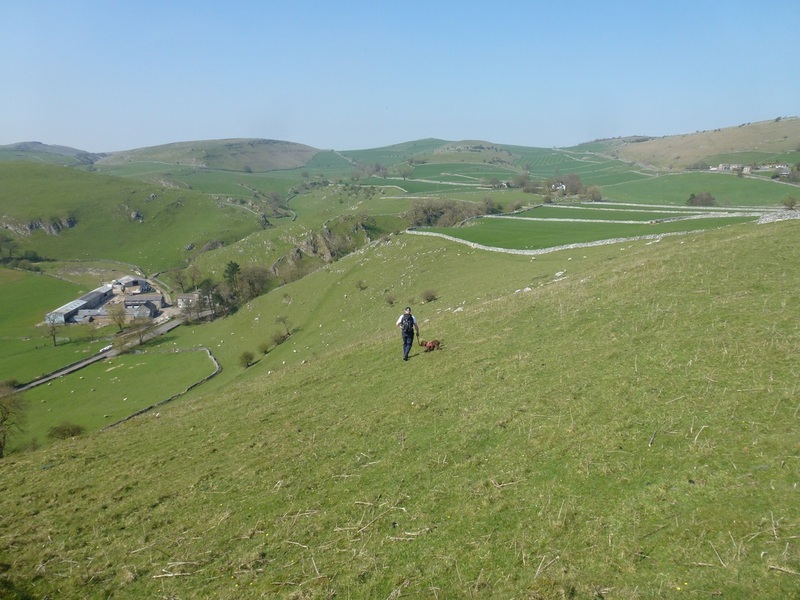 Heading down the slope from Hitter Hill. 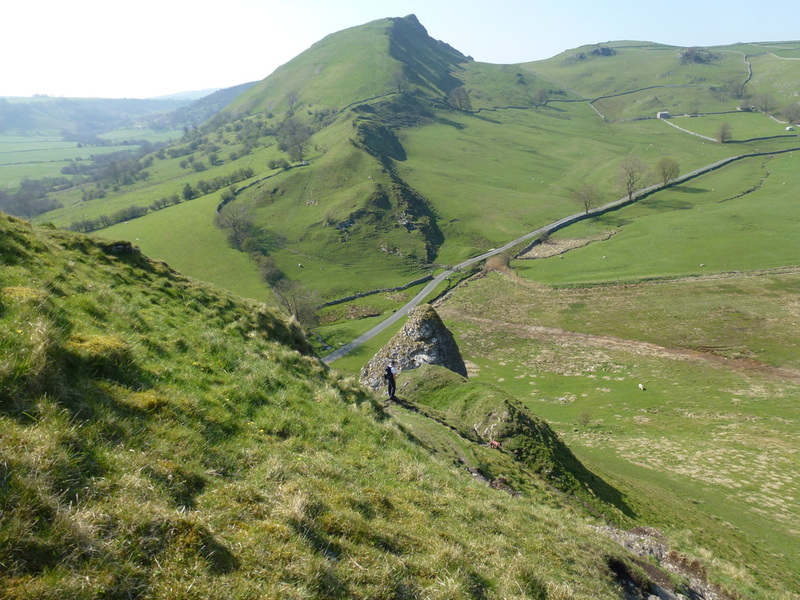 The drop to the left is steep therefore it is best to head for the wall on the right and then drop down to the lower wall on the left via the path. 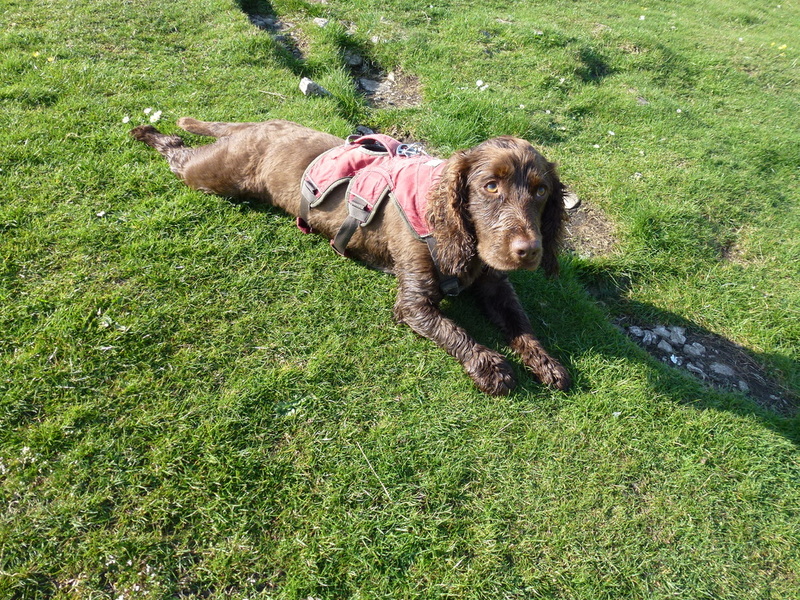 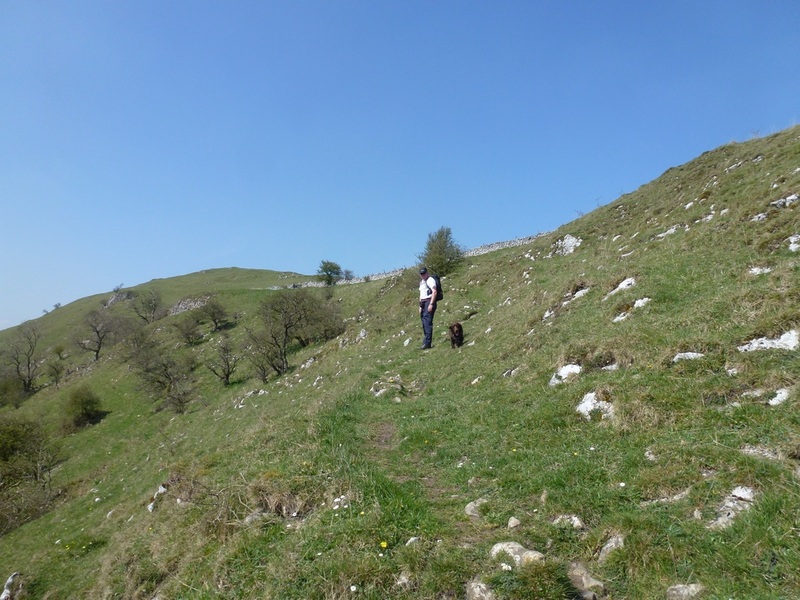 The path steepens even more on rounding the summit - we just took our time down this stretch - apart from Fudge that is! 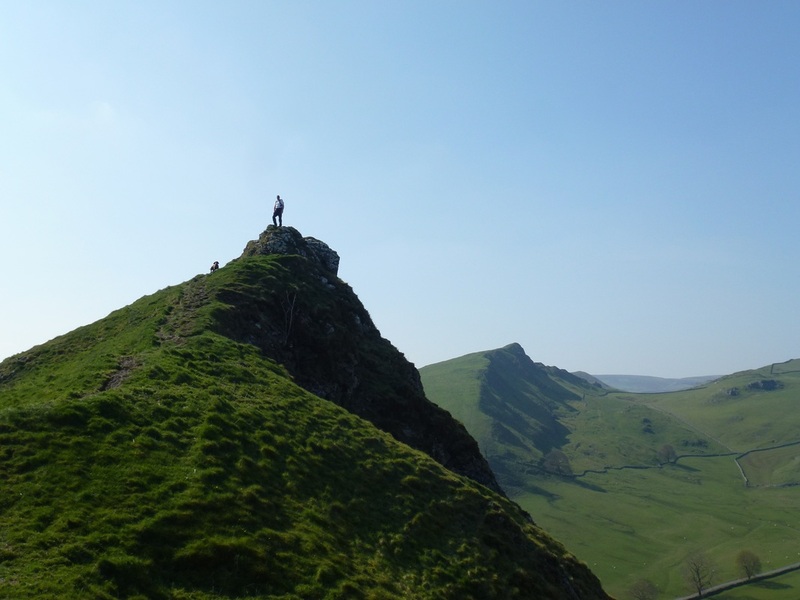 Near the top of Chrome Hill was this finger of rock - never one to refuse a photo opportunity! 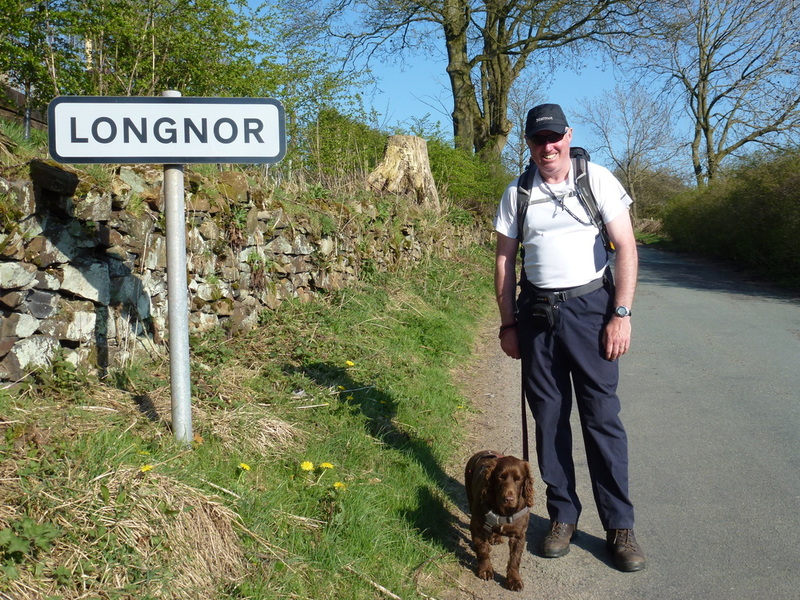 Quick march and off we go on the path back to Longnor via Hollinsclough. 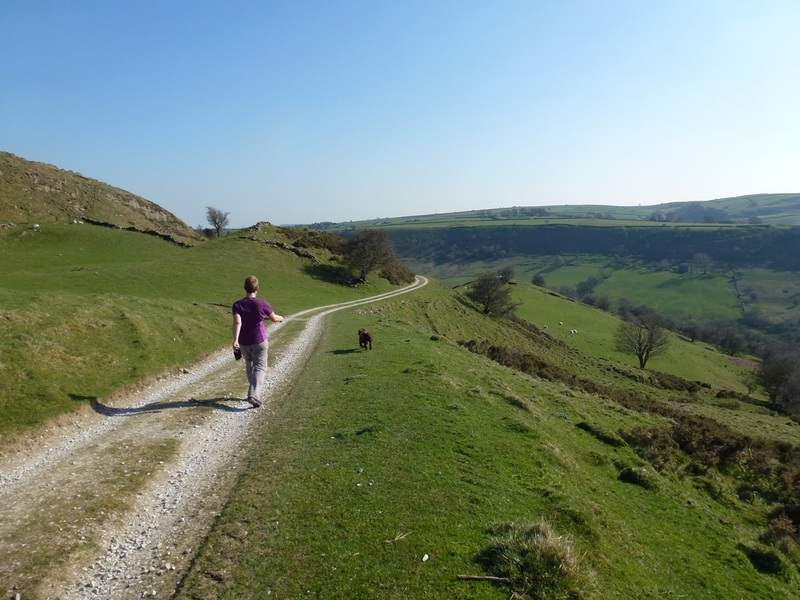 Hollins Hill is to the left. 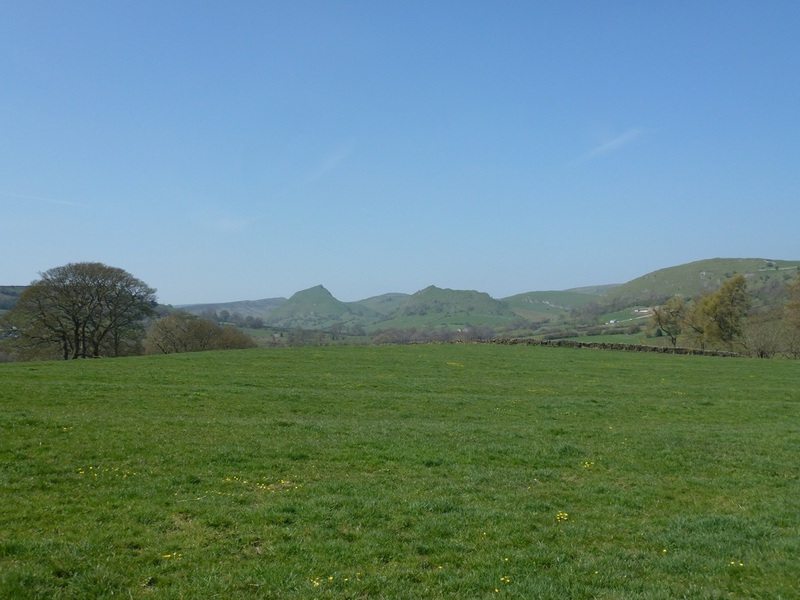 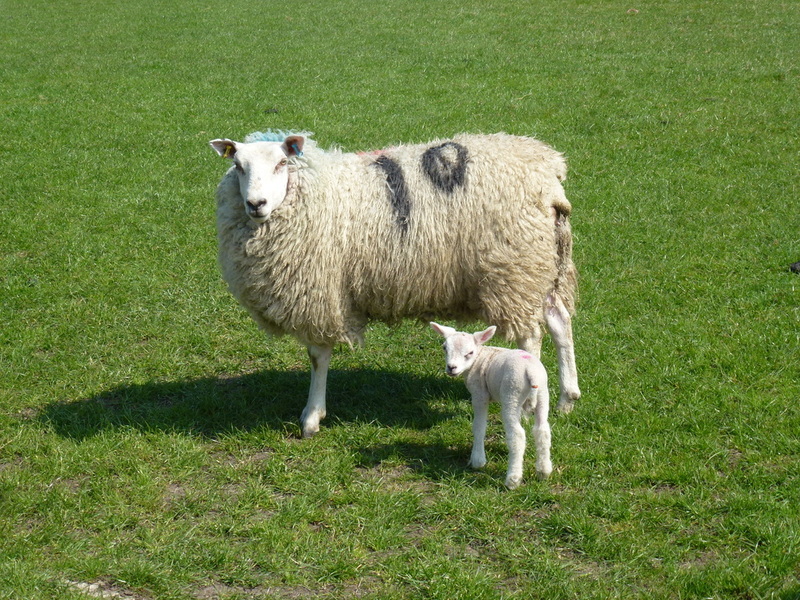 The last part of the walk from Hollinsclough to Longnor was by road - a quiet one at that. 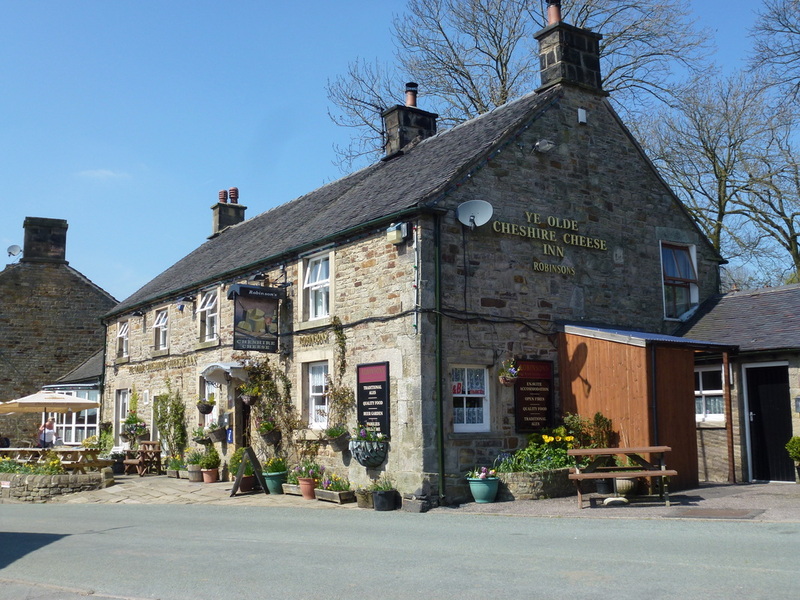 Back in Longnor - time for a beer.